Hundreds gather in Tunis to protest murder of engineer that Hamas has blamed on Israel. 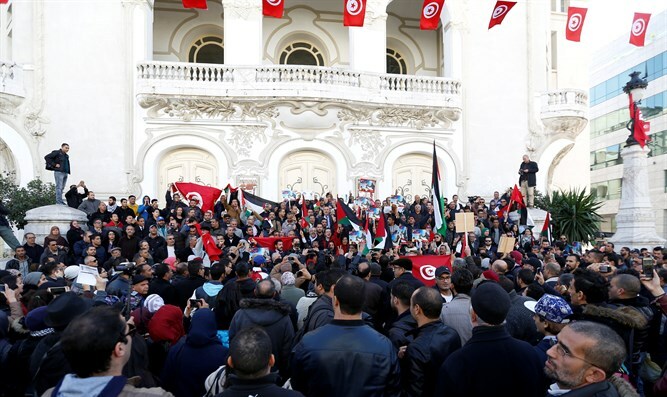 Hundreds protested in Tunis on Tuesday over the murder of a Tunisian engineer last week that Hamas has blamed on Israel, AFP reported. Mohamed Zaouari, 49, was murdered at the wheel of his car outside his house in Tunisia's second city Sfax on Thursday. He was hit by 20 bullets. Hamas’s so-called “military wing”, the Al-Aqsa Martyrs’ Brigade, admitted Zaouari had worked with it and claimed that the “Zionist regime” – meaning Israel – was responsible for the death. Waving Tunisian and Palestinian flags, more than 200 protesters walked up a main thoroughfare in the Tunisian capital on Tuesday, an AFP correspondent said. "With our soul, with our blood, we will avenge you Palestine," they chanted. Protester Mohammad Ammar said Zaouari was "a martyr with a capital M" and his murder was "a loss not only for Tunisia but also for Palestine and the Arab nation". On Monday, Tunisian Interior Minister Hedi Majdoub said Zaouari’s murder had been planned abroad by foreigners, though he admitted that “we do not yet have any tangible proof”. Tunisia's prosecution has said 10 suspects, all Tunisians, have been detained for questioning, including a female journalist. The interior ministry has said police are looking for at least two foreigners in connection with the killing. Majdoub on Monday indicated the murder had been planned as far back as June in the Austrian capital Vienna and in the Hungarian capital Budapest. Israel has not responded to the allegations. The death of Zaouari, who was reportedly known for innovations in the field of aviation, comes as Hamas continues to rebuild its infiltration tunnel network into Israel, after the IDF destroyed the network during Operation Protective Edge in 2014. In addition, the group has invested considerable resources in the development and procurement of weapons, including long-range missiles that cover most of the territory of the State of Israel. As part of these efforts, Hamas conducts ongoing missile tests meant to advance its domestic rocket arsenal ahead of its next terror war against Israel.